Low back pain (LBP) is one of the most common reasons for physician appointments. However, treatment results remain suboptimal, resulting in high rates of chronic pain, narcotic usage, surgery, depression and disability—all at great cost to individuals and the nation. 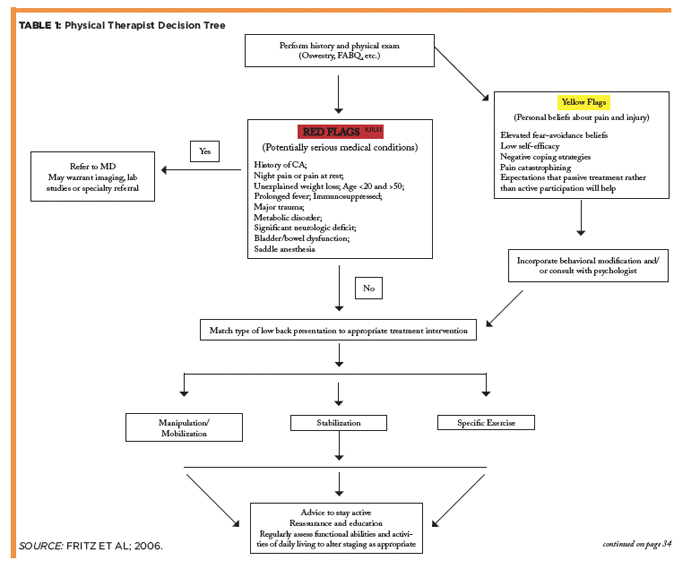 One reason for this is the current practice of grouping all low back pain patients without a specific etiologic diagnosis into the single nebulous category of “non-specific LBP,” for which the evidence base does not support any specific treatment. This methodological flaw has perpetuated the notion that no intervention is superior to the passage of time.5 Recent evidence reflects the need for categorizing non-specific LBP into distinct subgroups and, thus, direct treatment that will likely produce favorable results. The purpose of this clinical commentary is to introduce and describe an LBP classification system that focuses on non-specific LBP that points to specific treatment pathways and to discuss the impact of early access to physical therapy on this patient population. A promising classification system that has gained popularity is the Treatment-Based Classification System (TBC), which is based on the original work of Delitto and colleagues in 1995.6-8 This approach uses information gathered from the physical examination and from patient self-reports of pain (10-point pain scale and pain diagram) and disability (modified Oswestry questionnaire, see Figure 1). This information allows patient subgrouping, which then guides patient treatment.6-9 This system combines and modifies different schools of thought into a more practical, evidence-based system. LBP can be incredibly painful. I’ve dealt with a few strains and muscle spasms in my life, as well as two ruptured discs. Getting physical therapy and regular exercise is important to helping manage this pain and making sure you do not indirectly cause it in any way. Thanks for sharing!